On December 17, 2010 Mohamed Bouazizi lit the match which, together with the fire that killed him, also lit the fire of revolt. His self-immolation was the negative side of the current impasse of capitalism. The expulsion of labor-power value from the reproduction cycle of capital, the continuous devaluation, and the destruction of variable capital that dominates the crisis so far, defined the context of the suicide of a young Tunisian with no future. At the same time, the effectiveness that this suicide had on class struggle confirmed that we are now in a transitional period of this crisis – in the era of riots. It’s no coincidence that the theory of our era as an “era of riots” would be formulated most lucidly by a handful of Greeks. 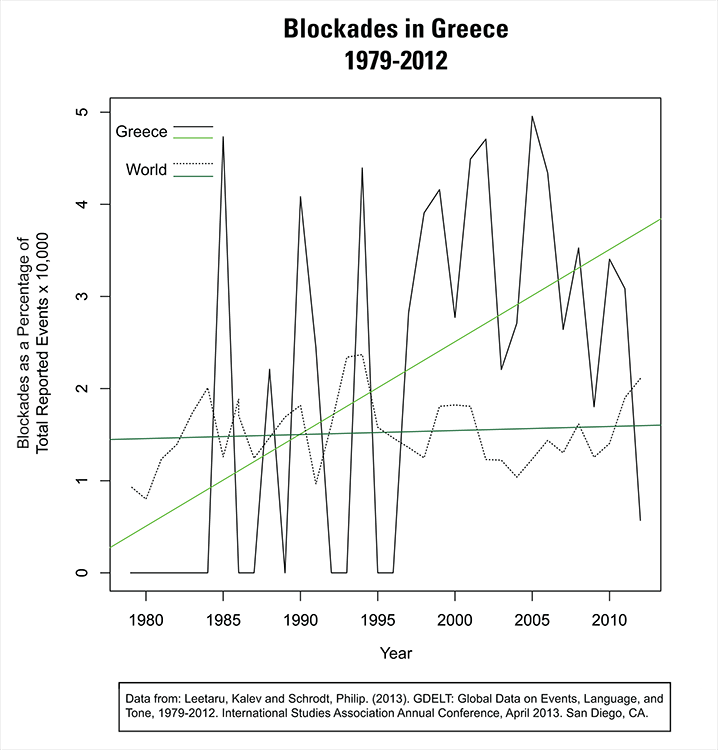 As the article quoted above was being published, Greece was sitting on the verge of its squares movement, which would see Syntagma occupied, parliament besieged, and the brief rejuvenation of the mass riots that began with the murder of Alexandros Grigoropoulos in 2008 and the insurrection that followed. Throughout this period, the theory was expanded. 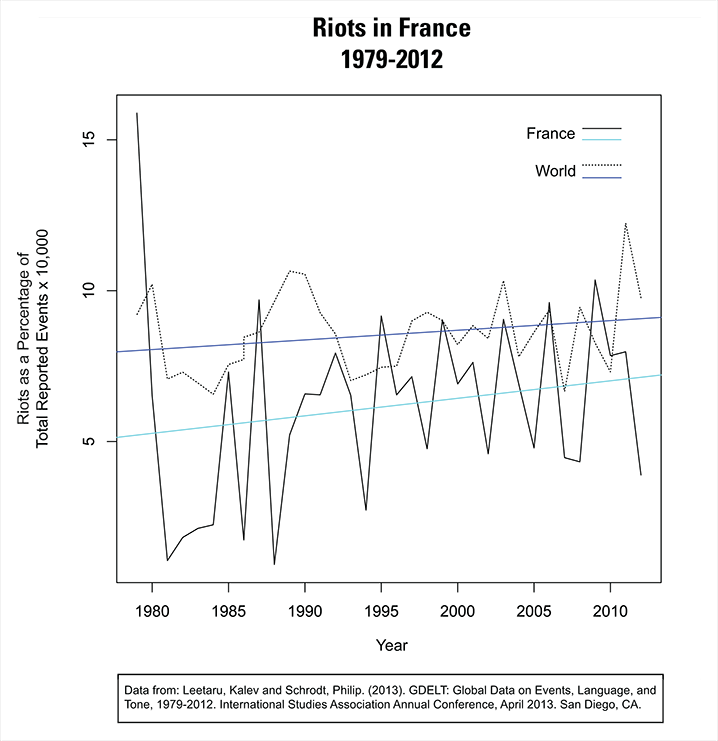 Alain Badiou claimed that the era of riots was, in fact, the “Rebirth of History,” while others were more skeptical. In the winter of 2013/2014, many riots and occupations took a sharp rightward turn, a phenomenon that we refer to as The Solstice. Much of this has raised new questions, but the basic thesis has not changed: riots are the present substrate of class war. They are our immediate future. The prospects for a communist project in the 21st century will, of necessity, have the riot as its starting point. 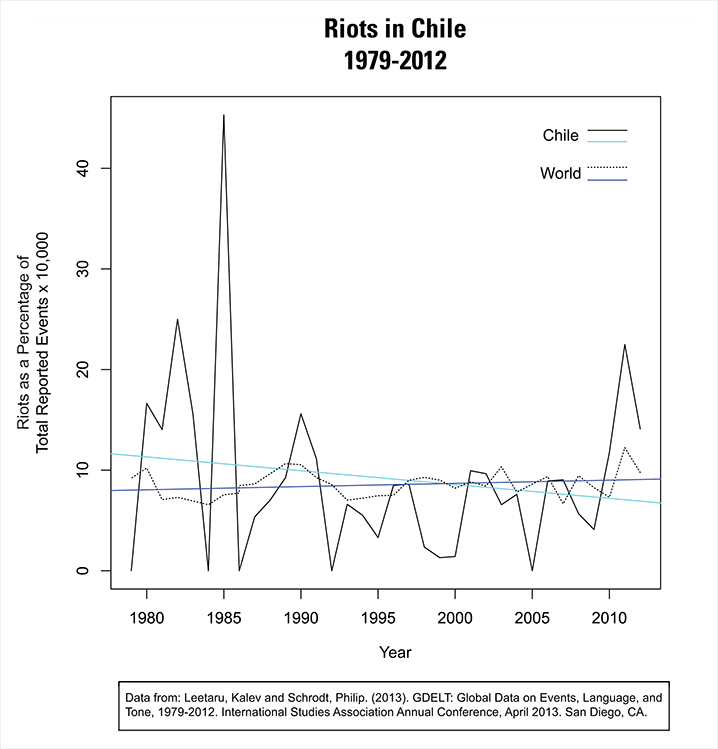 But the era of riots hypothesis has, thus far, almost entirely lacked an empirical basis. 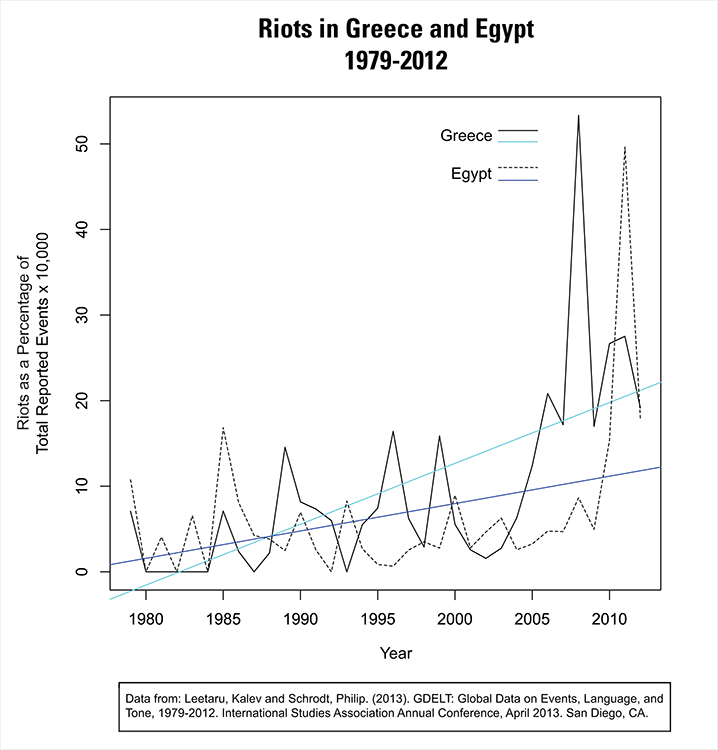 We have based the theory around off-the-cuff excitement generated by the first two major insurrections of the 21st century (in Greece and Egypt). These insurrections emerged at the same time that structural adjustment and austerity regimes piloted in Latin America, Africa and the former USSR were applied wholesale to Europe, resulting in new (or maybe re-emerging) forms of struggle that proved indigestible for the state—as true for Hollande’s hollowed-out social democracy as for Cameron’s run-of-the-mill neoliberalism. The resulting riots obviously signaled that something was changing, but such tectonic shifts have, since the 1970s, become the norm. It becomes difficult, then, to distinguish an “era of riots,” short of some visible and quantifiable shift in the valence of struggles on the global scale. Here, we lay out some reasoning for why it is correct to claim that our era is, indeed, an era of riots, in a certain sense. This is justified by clearly quantified data gathered from the largest news-aggregation database that currently exists, the Global Database of Events Language and Tone (GDELT), put together by Kalev Leetaru and Philip Schrodt from tens of thousands of news sources in over one hundred languages dating back to 1979. 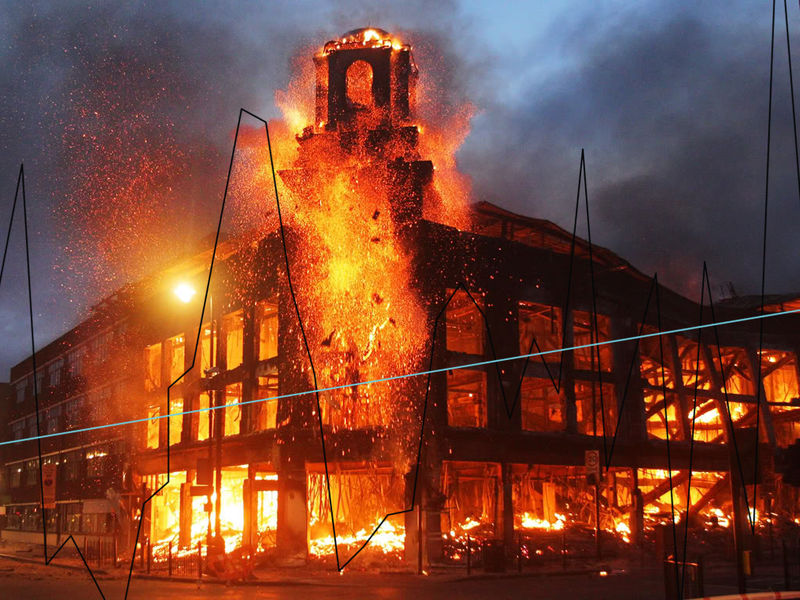 This database is by far the best existing source to track the locations and long-term patterns in riots, strikes, and blockades, which each have their own distinct categories within the database. That said, the categorization used by the system is not without its problems. What is and is not categorized as “protesting violently” in media reports is clearly subject to an immense amount of bias, and enormous numbers of such events simply go unreported. The database proves very poor when trying to “zoom in” on smaller-scale patterns or single events, and it naturally includes plenty of outliers. Nonetheless, its sheer size means that aggregate patterns over time tend to correct for such errors, especially at the global scale. More importantly, the database contains very little ability to distinguish the character of such events, particularly riots. Though it contains sub-categories for riots that seek “leadership change,” “policy change,” or that demand “rights,” or “major institutional, constitutional or regime change,” the coding system contains no sub-categories for riots that have no coherent demands reported by the media, or demands that do not fit the categories. The way that the media tends to report on such events also tends toward miscategorization, as when rioting Palestinian youth are coded as rioting to demand “human rights,” since major media outlets speak of the Israeli occupation as a “human rights” issue. In all of the data posted below, then, we have used only the general category for rioting, striking and blockading, which includes all of these subcategories. 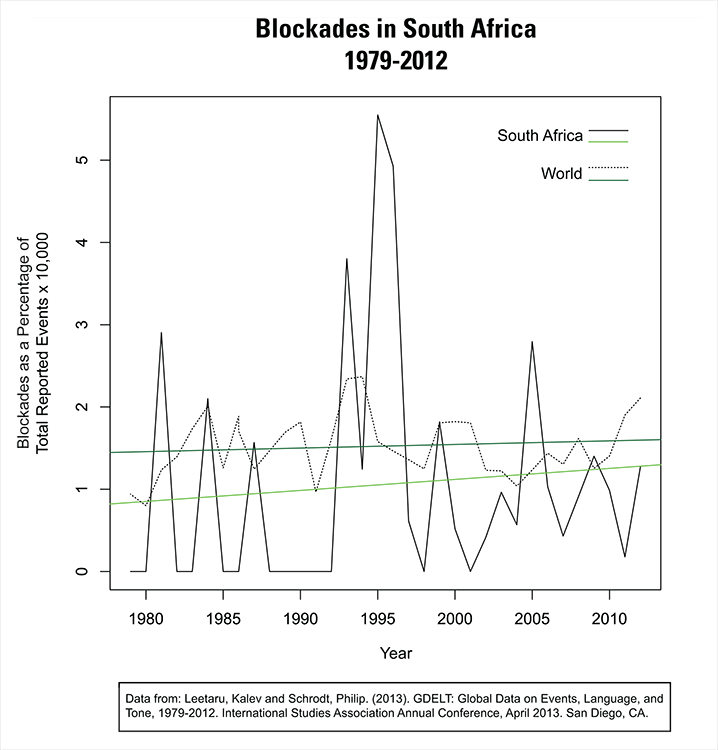 This means that the data below includes, as close as possible, data for all riots, strikes and blockades in the world from 1979 to 2012. The data for “protests” is excluded, since the category is vague enough to be largely meaningless for our purpose. This data is not further subdivided, except by country. The individual country data shown below is best for larger countries with more media integration. Numbers run for Tanzania and Tunisia, for example, were inconclusive prior to the late 1990s and early 2000s, with too many years listing “0” riots, strikes or blockades to be offering an accurate picture of class dynamics in those countries before the advent of the internet. Similarly, the US is excluded because the actor codes used by the database tend to confuse riots, strikes or blockades within the US with events outside the US but targeted toward it, including “violent protests” against the US in Iraq during the height of the Iraq war. The most significant problem with this database, for our purpose, is that it only goes back to 1979. This makes fair comparisons with historical periods prior to this impossible. We cannot easily compare the current era to the period of struggle that began in the decades after WWII, nor can we compare it to the turn of the 20th century, nor to the battles of 1848 in Europe—in short, we cannot compare it to other eras of the riot. Comparisons can be made based on absolute number, but the advent of mass print media and the internet create an absolute numerical bias that is difficult to correct for across databases. This bias is regulated within the work below, however, since all data are normalized by the total number of reported events. The database increases in absolute terms over time with the proliferation of media sources in the information age, making any event appear to increase over time. 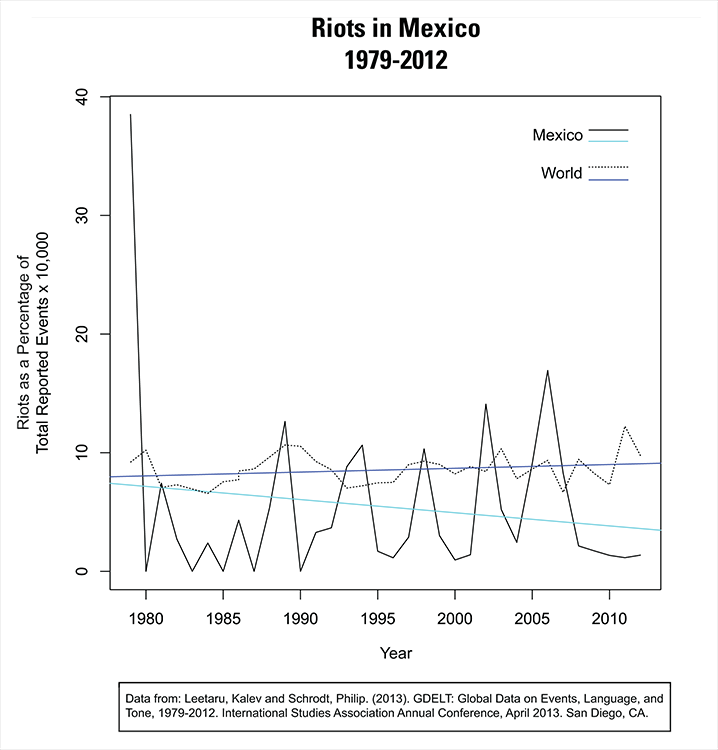 Dividing the number of riots, for example, by the number of total reported events in the world (or in a given country), then gives riots as a percentage of total reported events, which I’ve multiplied by 10,000 simply to make it read better on the charts (rather than being listed in scientific notation). In these charts the black, spiky lines connect the actual data-points, which sit at each year (though aggregated from daily data). This makes the flow a little coarse, but we still see the large patterns and all the data is included. The blue, red and green lines show the line-of-best-fit for the distribution of points for riots, strikes and blockades, respectively. This allows us to observe long-term trends in the events, but these lines can also be offset rather easily. Spain, for example, is excluded since a large spike of “riots” is created in the early 1980s by right-wing anti-Basque attacks, which were carried out by paramilitaries and therefore did not have the character of a riot (even a right-wing one), so much as an act of military repression. 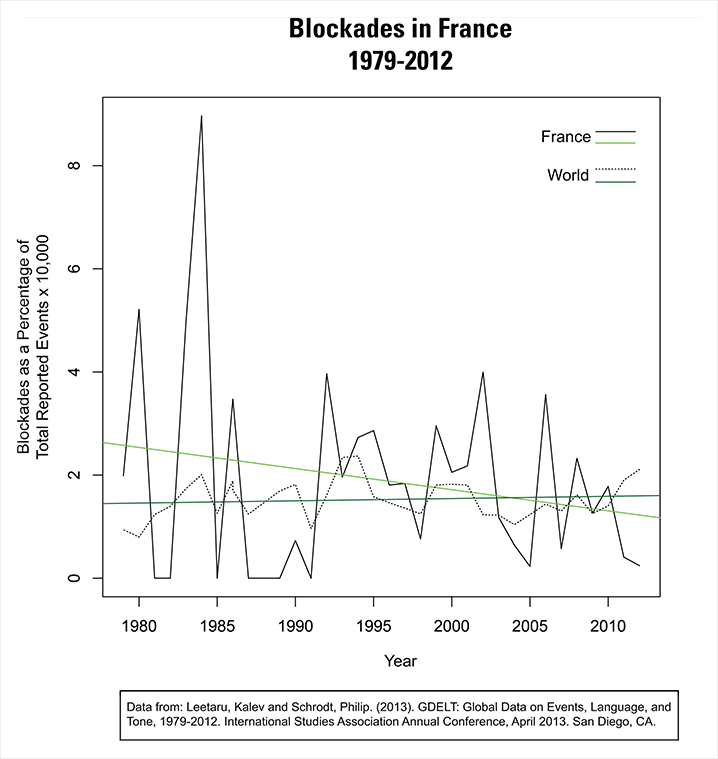 France, however, is included, since a similar spike in the early 1980s is created by the property destruction and assassinations carried out by Action Directe, which arguably still fit the character of a “violent protest,” since they were not military actions, even though they were armed. Finally, there is an obvious limit to such number-crunching. For Badiou, the proliferation of riots is less important than the way that these riots relate to themselves—particularly how they declare or name themselves, and whether or not they are “inscribed” within systems of “finitude.” In more concrete terms, it is useful to remind ourselves that aggregate numbers of events only speak to a very narrow interest in whether things are increasing, decreasing or staying the same, while also showing some patterns exhibited within this movement. This movement itself is only as significant for questions of a certain scale. The claim that an era is the “era of riots” is, however, such a scale. 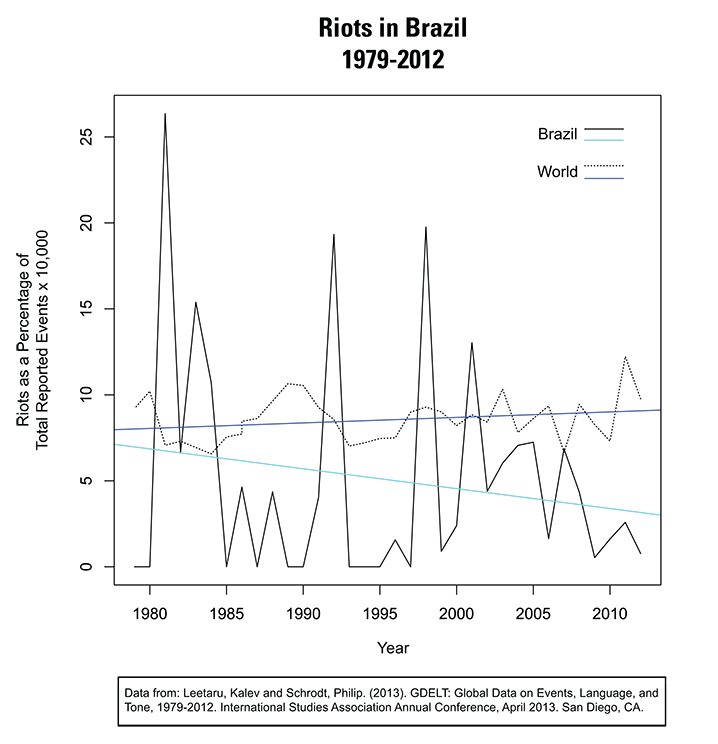 Here we see a moderate but clear increase in the line-of-best-fit for riots since 1979. 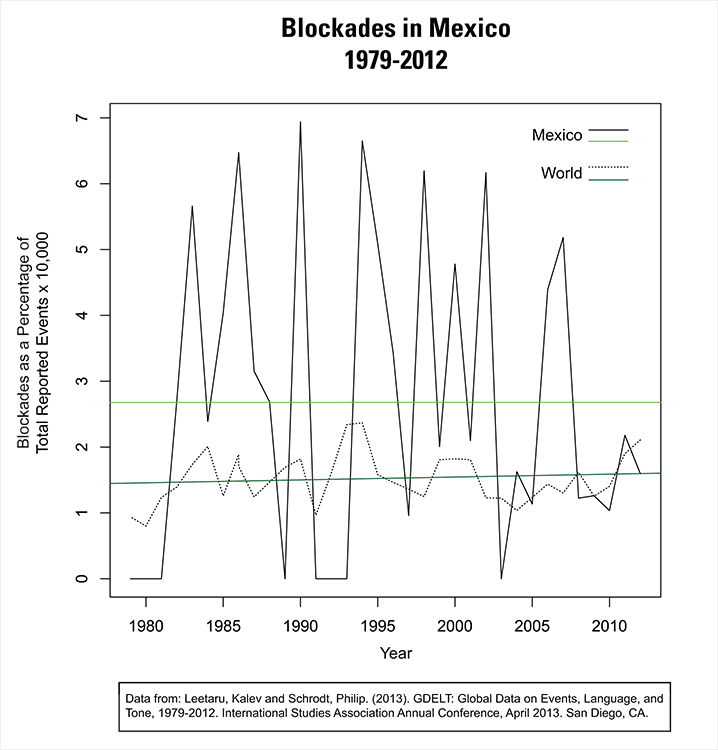 Large spikes are visible throughout the period, though the spike in 2011 clearly towers over any preceding it. 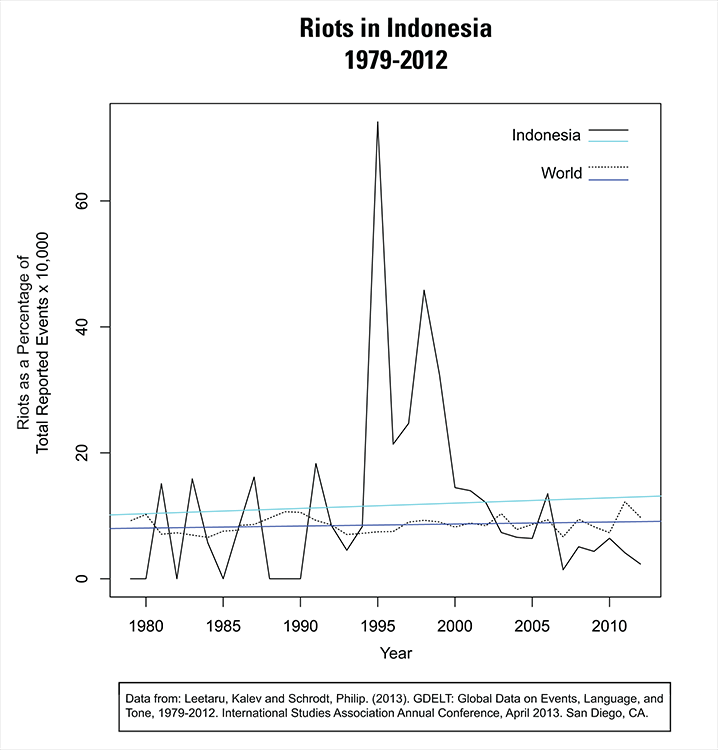 Also notable is the fact that the spikes in rioting around 1980 and 1990 were fairly discrete events, caused mostly by the dismantling of military regimes in Asia or the Americas and the fall of the USSR. After these peak, riots drop significantly. 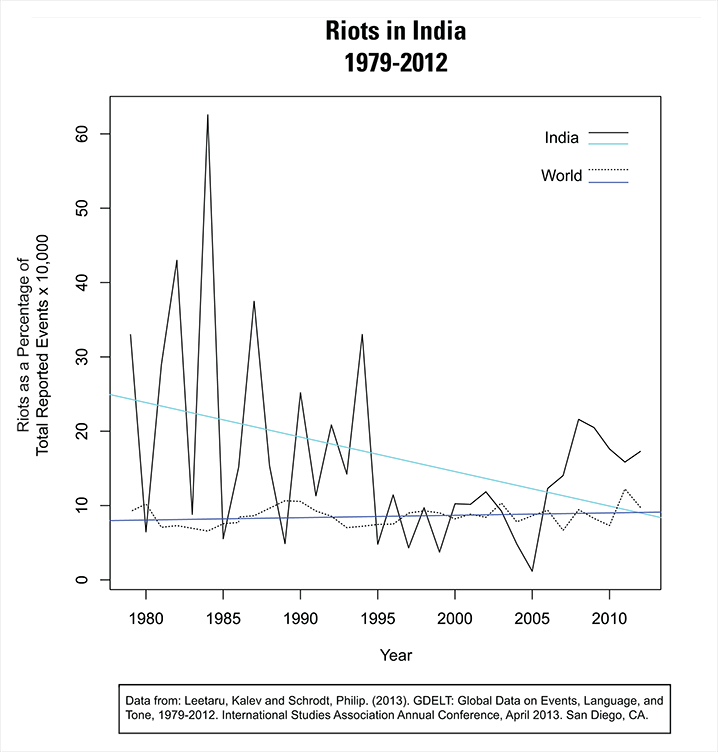 After the late 1990s, however, riots spike every year or two, ultimately building to the highs of 2011 and 2012. 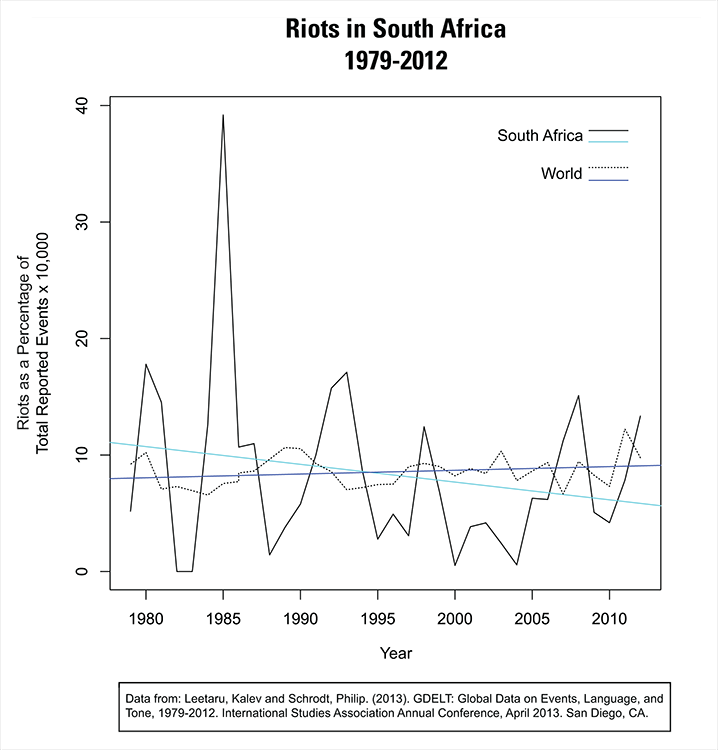 This seems to confirm the claim that the global valence of riots has increased. 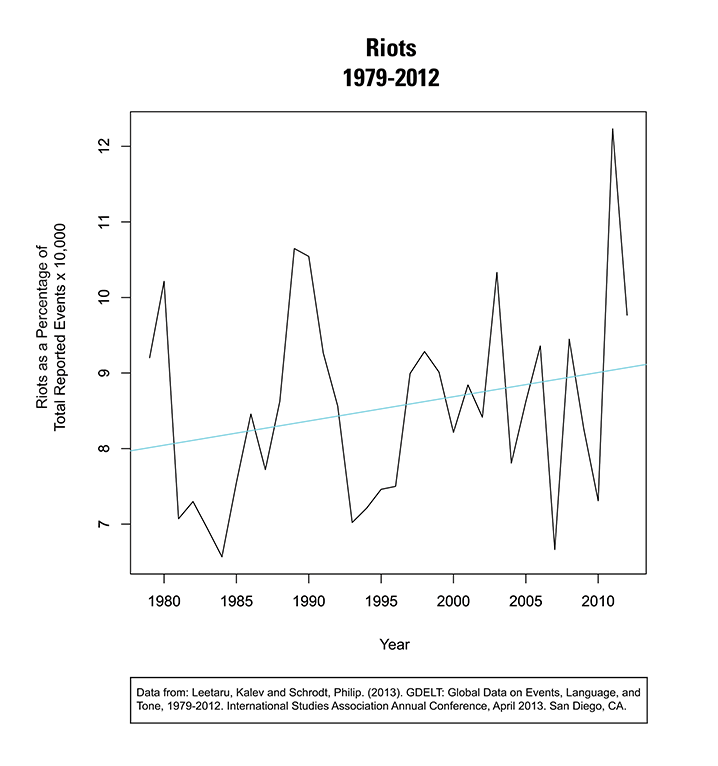 After the late 1990s, riots recur more regularly—and this was even true prior to the large increases in 2011 and 2012. 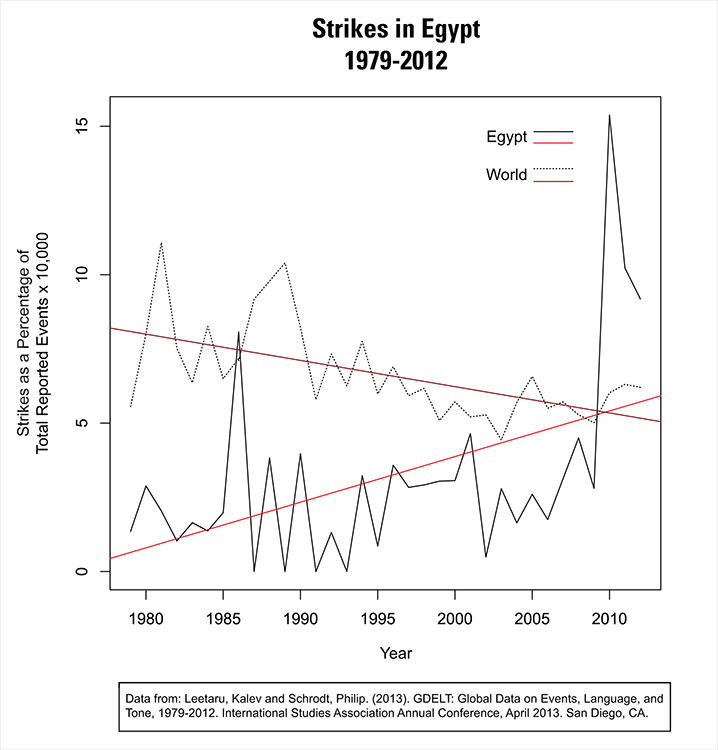 With strikes, we see an opposite tendency. 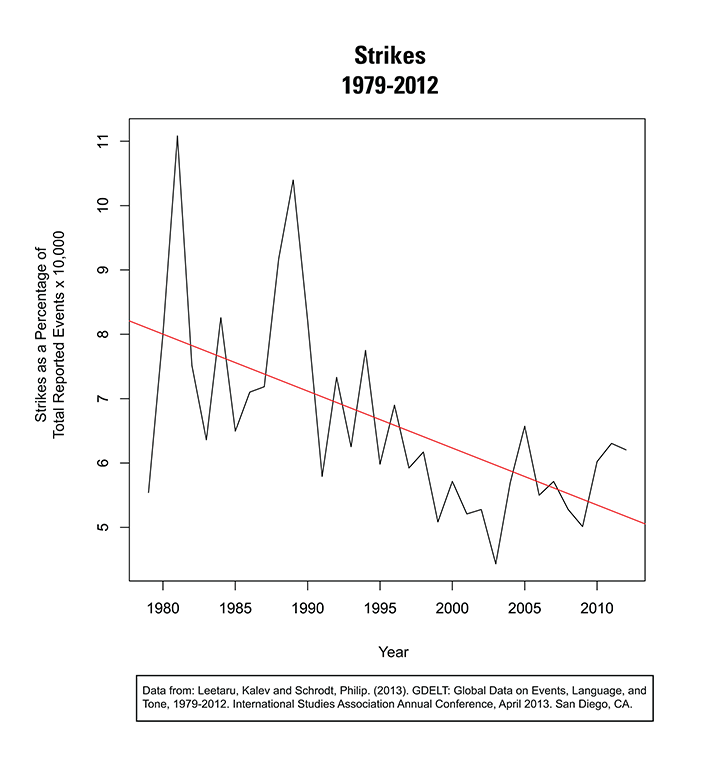 There is a clearly visible, sharp decline in strikes since 1979. 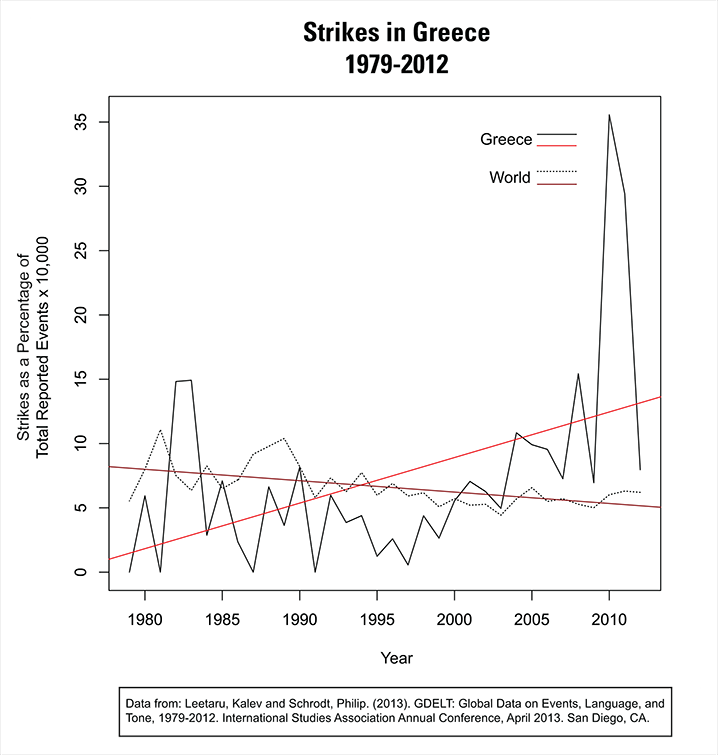 The decrease in strikes is about three times as severe as the rise in riots. 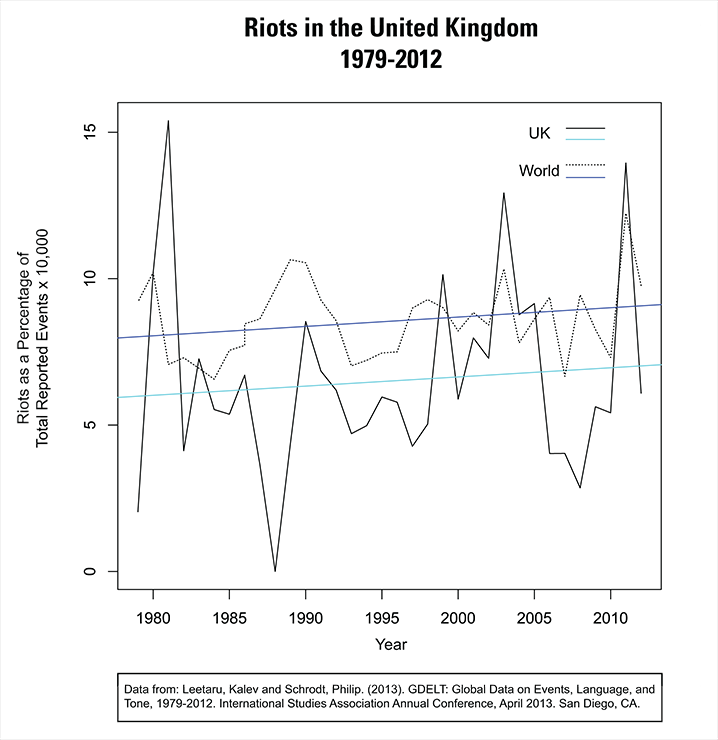 Whereas in the 1980s and early 1990s there were roughly equal numbers of riots and strikes as a percentage of total events (oscillating each year, but having similar averages), by 2011 and 2012 there were about twice as many riots as there were strikes at the global level. 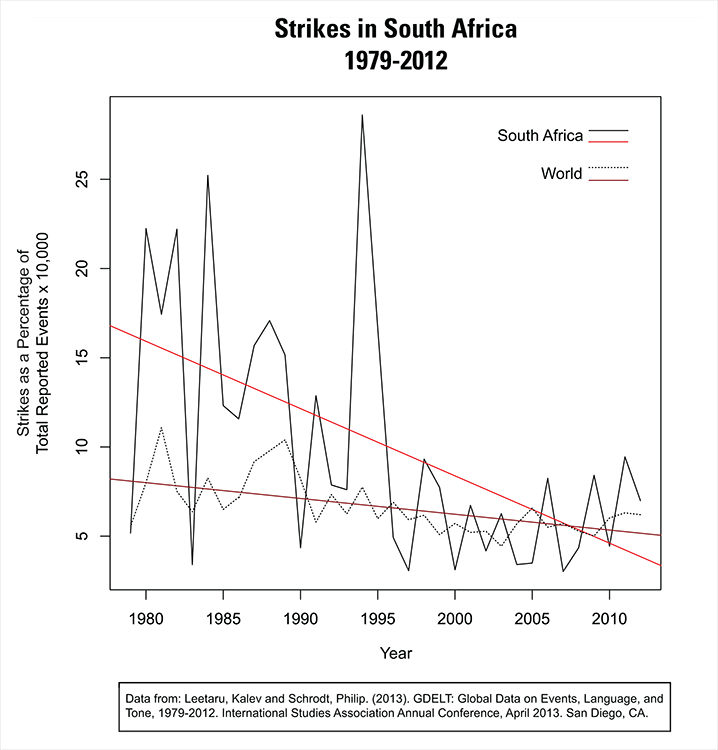 This is despite the spike in strikes visible in 2010, 2011 and 2012. This spike, though arguably significant, is minor when put in this thirty-year time frame. 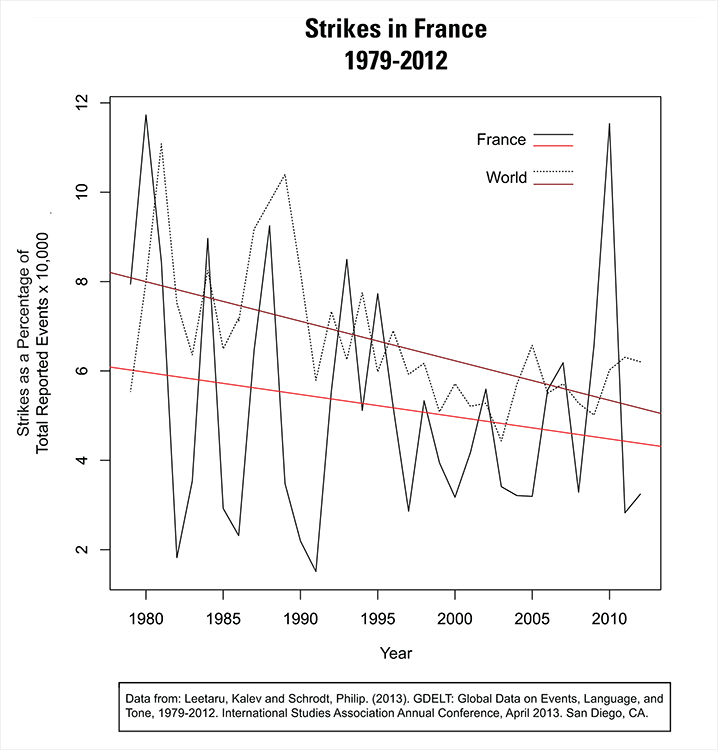 Note, however, that no statistical argument is being made here for actual inverse correlation between riots and strikes. The concern right now is long-term trends in the increase or decrease of the phenomena. Future work will explore correlations between this data and other variables such as food prices. 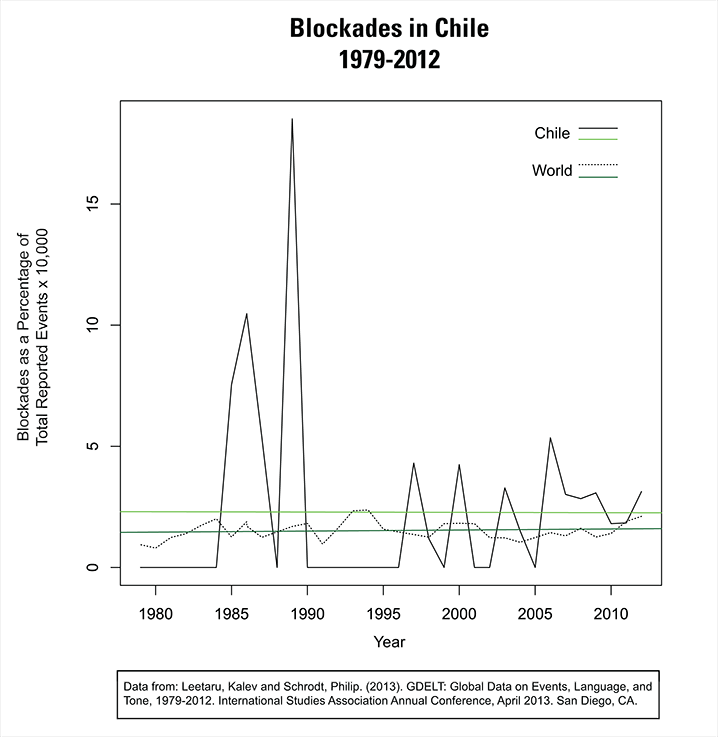 It has been tentatively argued that the blockade may, in fact, be starting to take on the role that the strike did in the 19th century—as a mechanism whereby the riot can evolve into a more disciplined and longer-term disruption of the valorization cycle, this time on its circulation end, rather than within the immediate process of production (in the mine or factory). 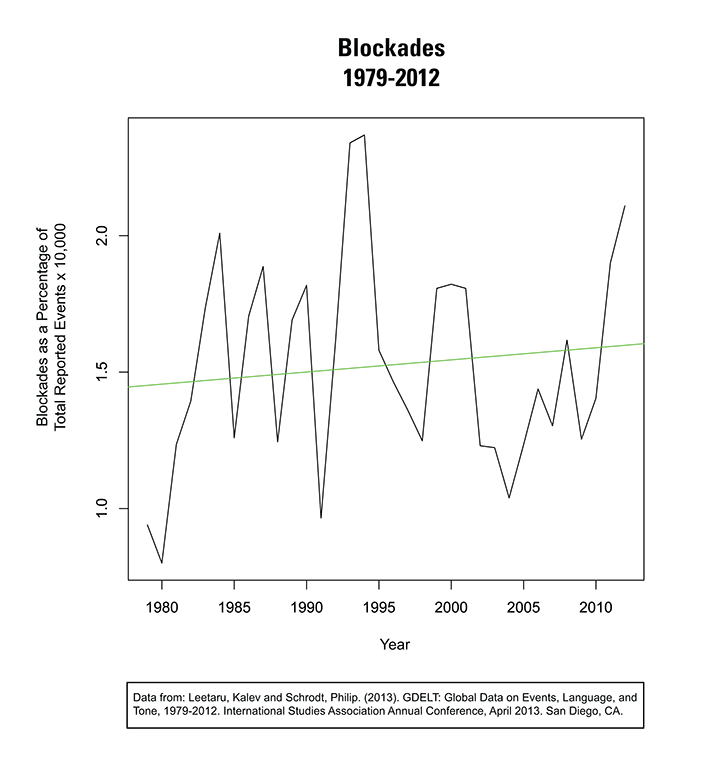 But the data shows no numerical increase in blockades. 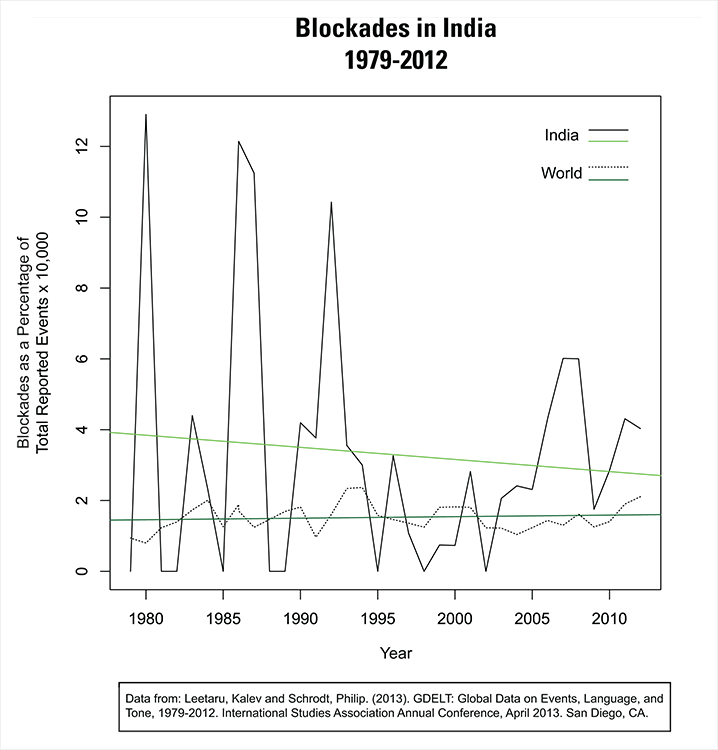 This doesn’t necessarily mean that the above thesis is not true, but that it must account for why blockades, in absolute terms, do not seem to be increasing or proliferating. 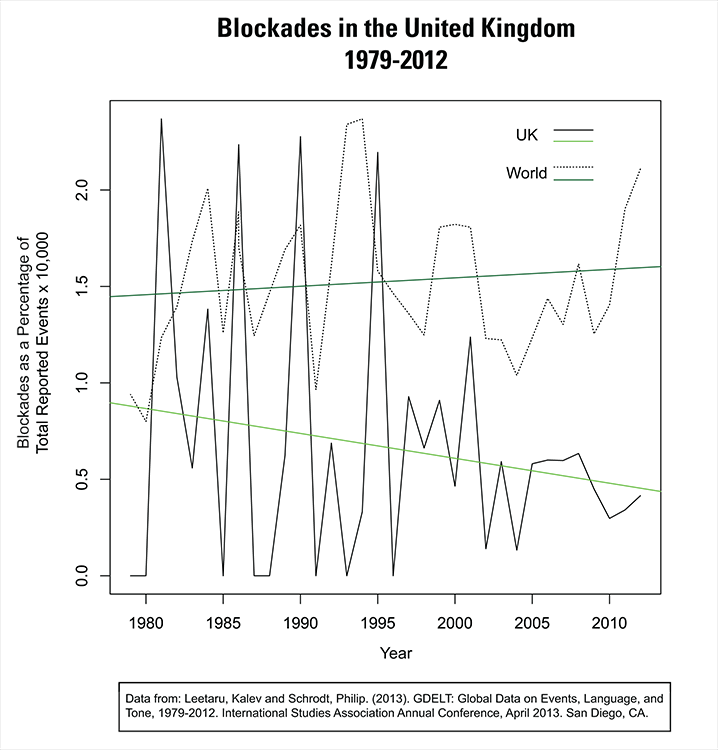 It’s also notable that they are far less frequent in absolute terms than either riots or strikes. 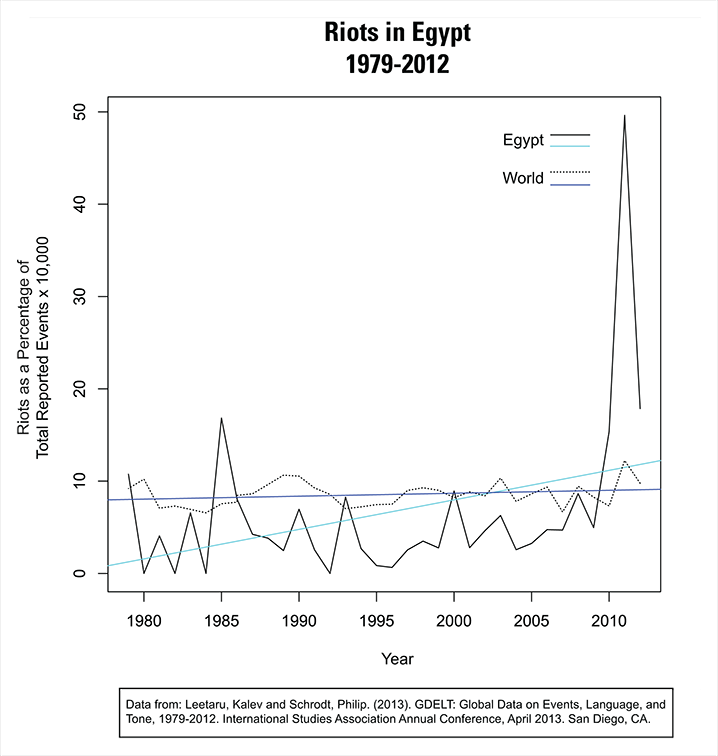 In Egypt we see a clear spike in each chart, all associated with the beginning of the revolution in 2011. It also in this period that the points jump well above the world averages. 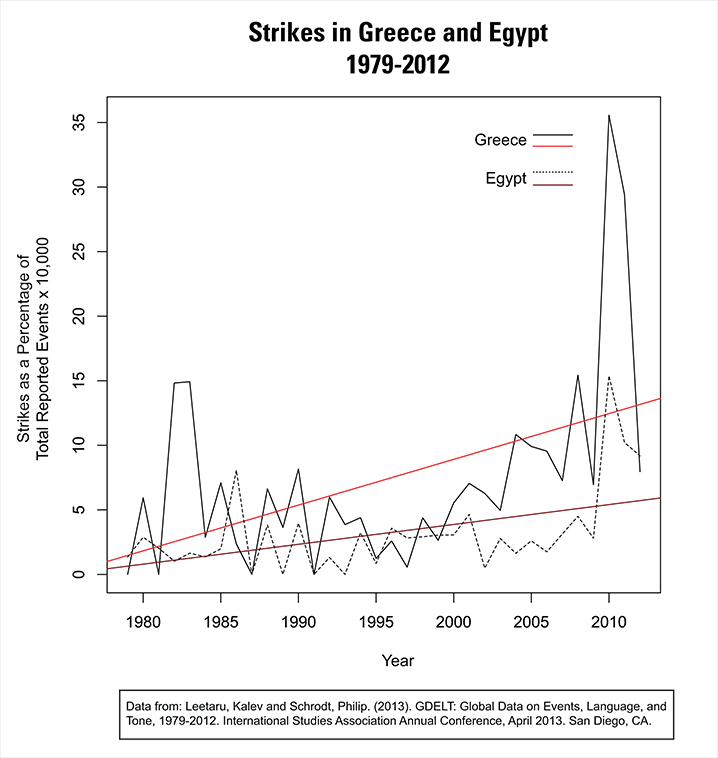 Note that long-term trends in riots and strikes were either stagnant or decreasing prior to 2010, 2011 and 2012, signaling that sudden changes in all of these tendencies are clearly possible without precursors visible on the same scale—meaning that something like the Egyptian revolution was not clearly preceded by more strikes or more riots, though there were marginally more blockades leading up to it. 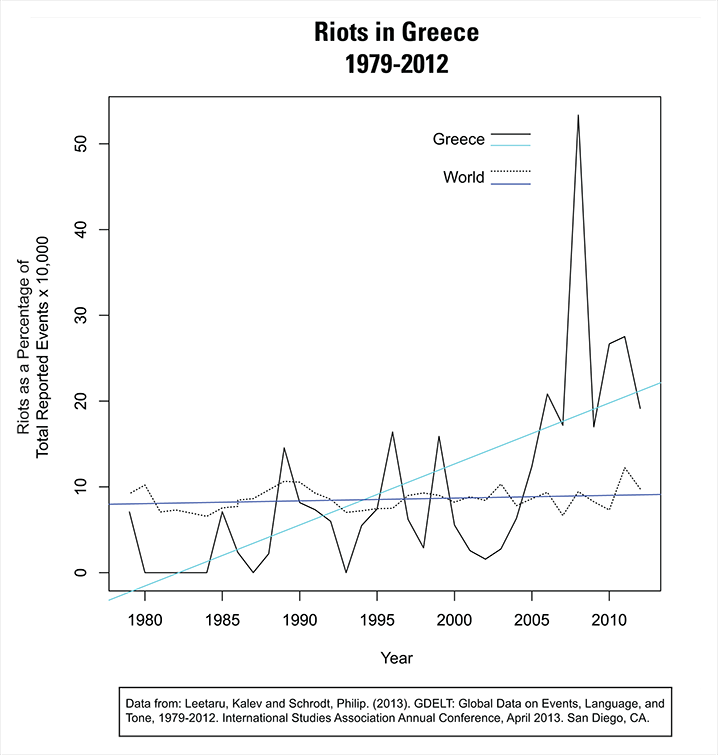 In Greece, we see a notable spike in riots in 2008, but one that was preceded by increases in the years leading up to it. 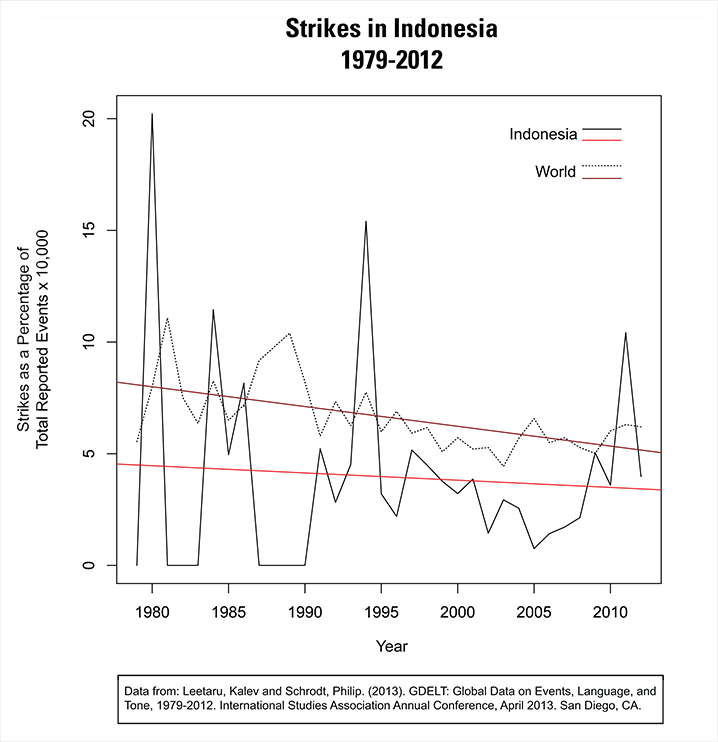 Similarly, strikes spike in 2009 and 2010, but only after a steady rise beginning in the 2000s. 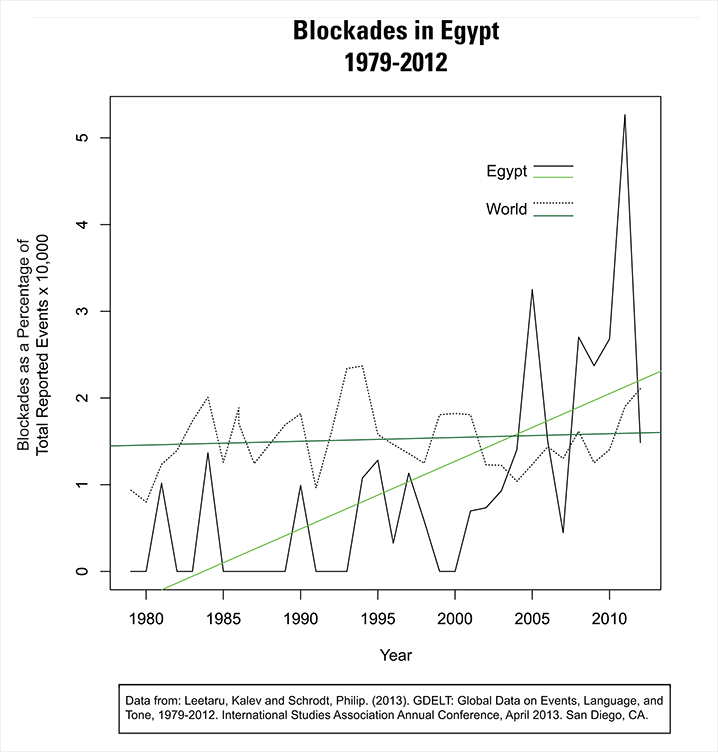 Blockades have a clearly clustered increase in the 2000s as well, in a trend that cuts above the global average, though riots in the same years are anywhere from five to ten times more abundant. 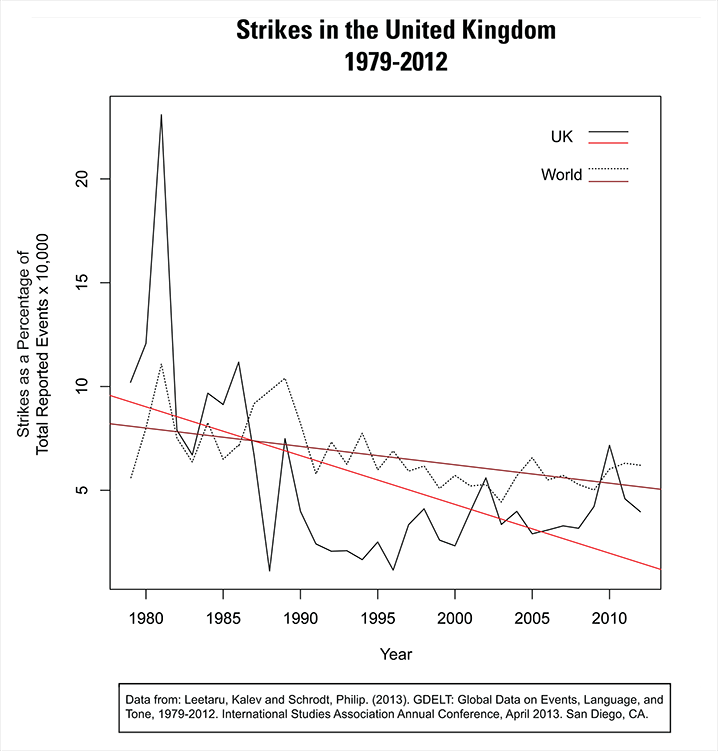 Similarly, despite the rise in strikes, riots in the late 2000s are at all points except in 2009 and 2010 nearly twice as common as strikes. 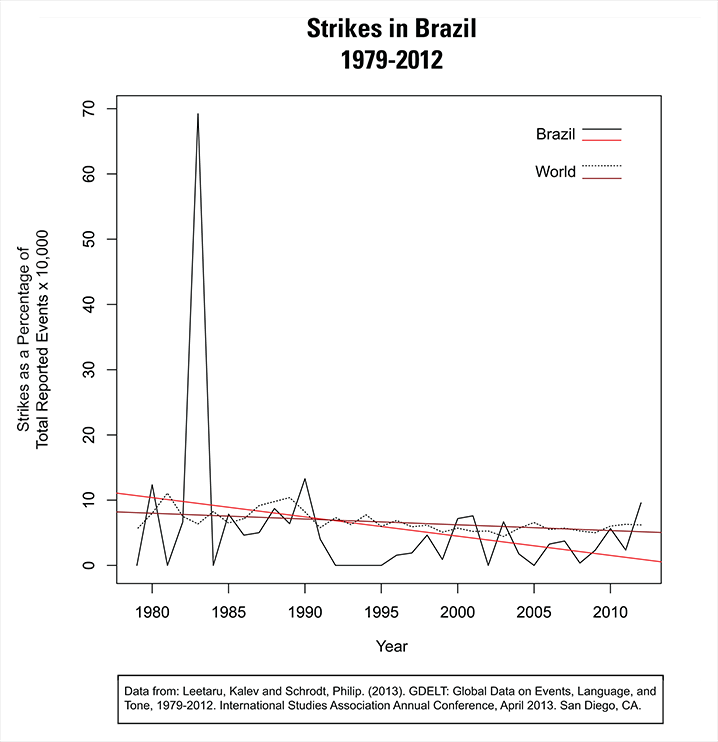 In 2009 and 2010, the highest strike years in the database, strikes only slightly exceed riots. China is an interesting case, since it is largely ignored by the existing literature on the “era of riots.” This is despite the fact that it has a significant number of riots, though they are often difficult to distinguish from strikes, since the two are often fused into a sort of “collective bargaining by riot.” It is, however, mistaken to accept at face value the media narrative about violent protests in China’s factory zones for rather limited demands, such as wage arrears. Though these demands are, in fact, being made, it is also true that the riots and strikes occurring in China very much exceed the limited demands that the media picks up on. These demands then become overdetermining, post-facto explanations capable of rendering such uncontrollable behavior into comprehensible grand narratives. 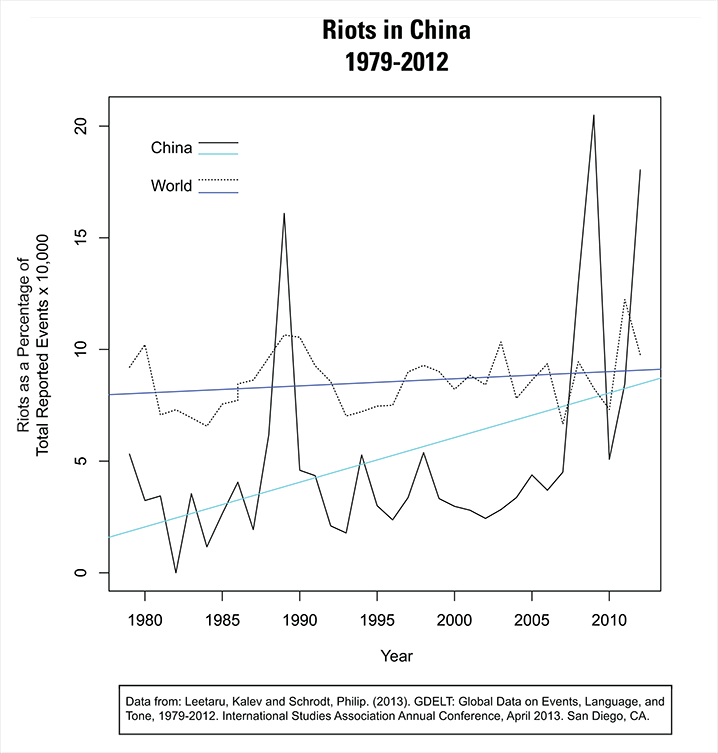 When we look at the data, we see riots in China jumping above the world average in the late 2000s and early 2010s, more or less concurrent with the outbreak of the global economic crisis—dispelling the myth that China was somehow “immune” from the sudden decrease in consumption associated with the burst of the real estate bubble in the US. Maybe more notable is that riots in 2009 and 2011 actually exceed the riot-wave associated with the Tiananmen movement in 1989, yet the riots of 2009 and 2011 weren’t nearly as visible or as immediately threatening to the central state. 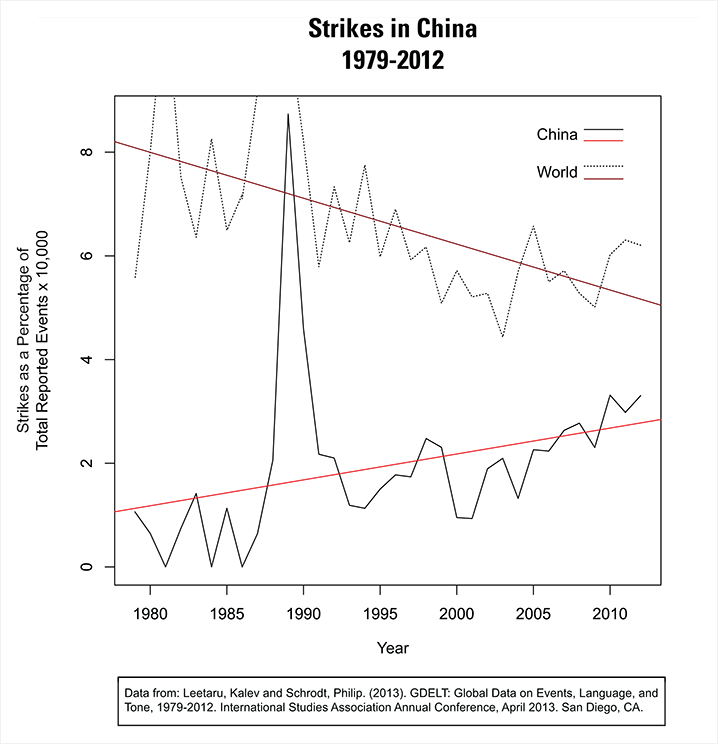 Strikes in China exhibit an opposite tendency to the world average—in fact, the trends are nearly an inverse mirror of each other. 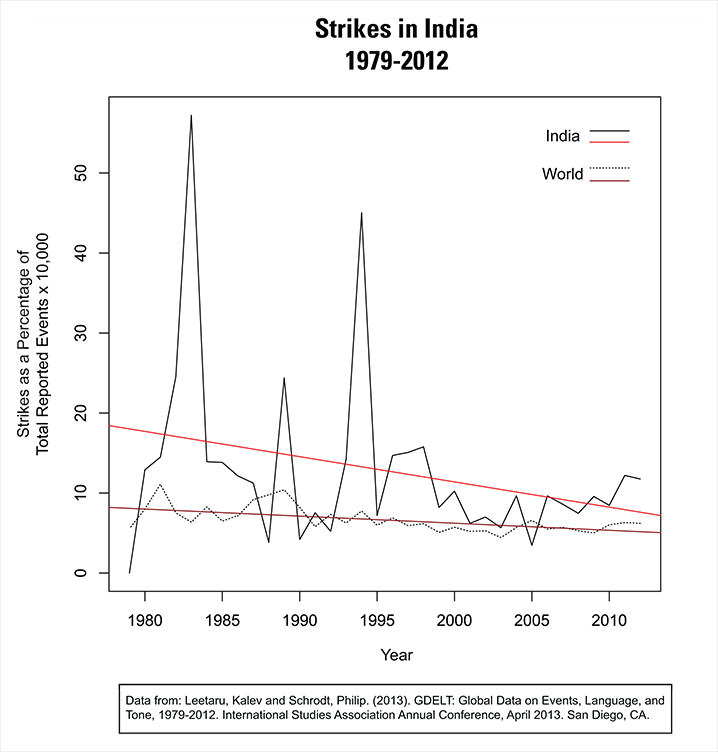 Yet strikes have not yet risen above world averages, and they come nowhere near the level they were at in 1989. 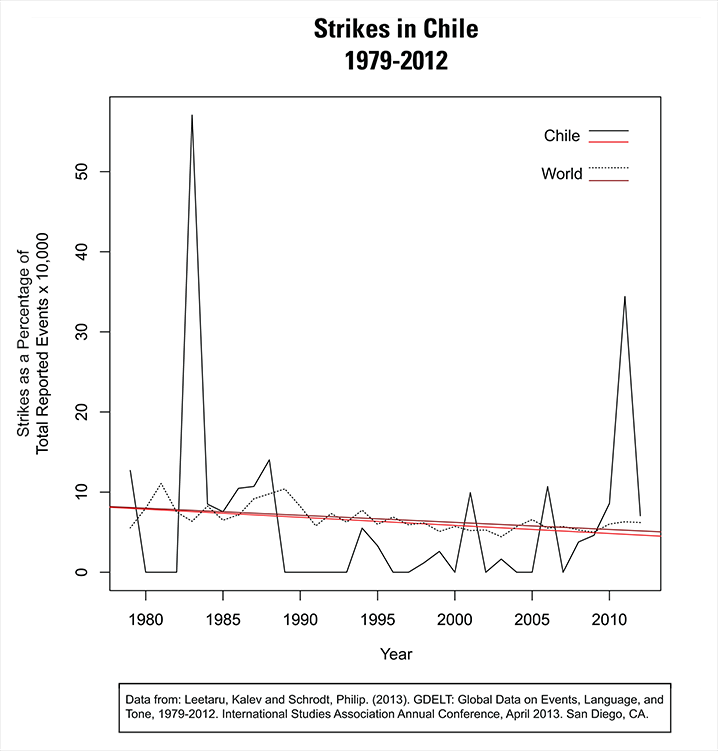 Riots, in the high years of 2009 and 2011, were five times more abundant than strikes. In the low years, they were only slightly greater. 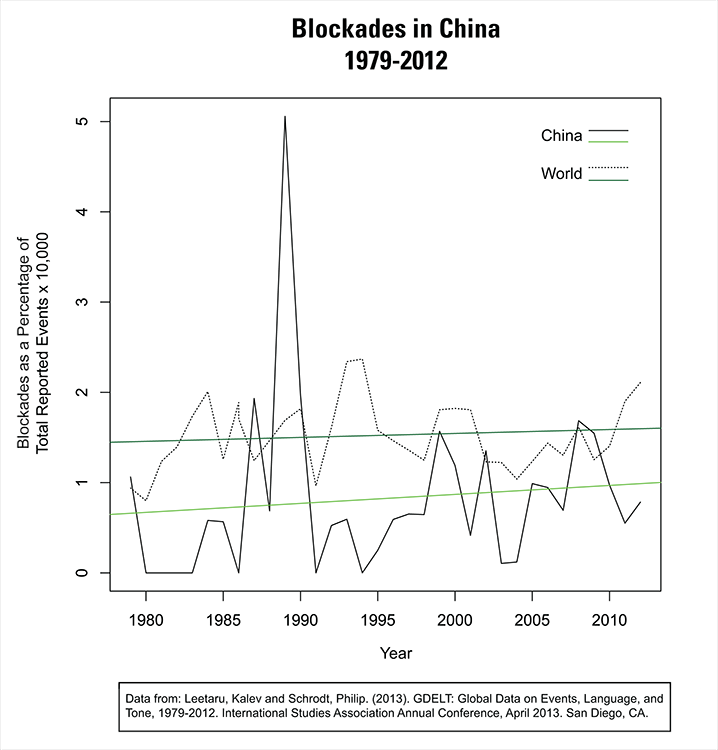 Aside from 1989, China largely follows the world trend in blockades, and, in fact, sits below the average. 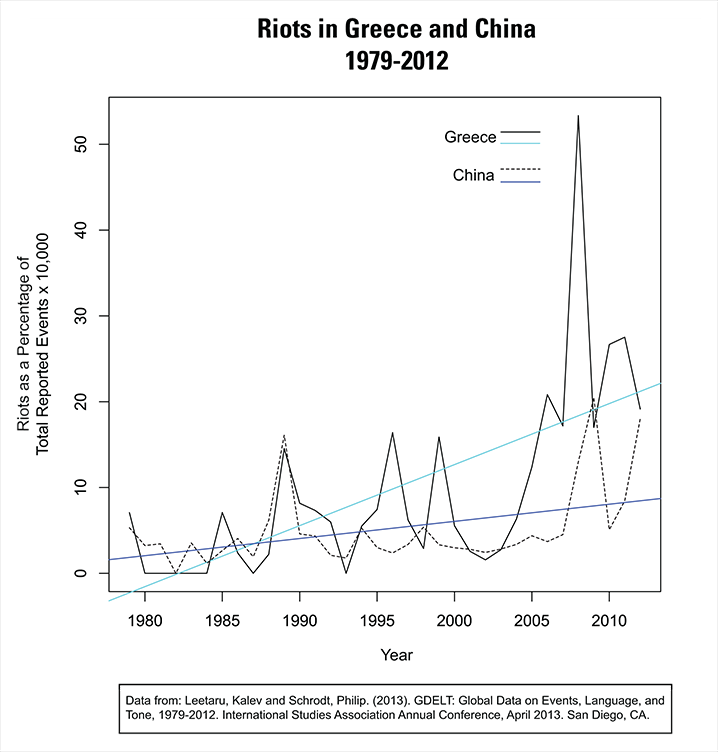 If we compare data for Greece and China, we also begin to sense the significance of Chinese events, as riots in the country begin rise toward Greek numbers (likely exceeding them if we were to limit the analysis to a Greece-sized slice of industry such as the Pearl River Delta). If the Greek riots are a symbol of a completely dysfunctional, besieged state on the verge of collapse, then this tendency should be noteworthy. Below, there are additional figures comparing Greece and Egypt, and national plots for Chile, Brazil, France, India, Indonesia, Mexico, South Africa, and the UK. Very interesting, Phil. I have looked at the distribution of riots in England and Wales from another perspective, namely, a comparison with the earthquake record. I have found that there may be a human response [i.e. riots, unrest and violent disorder] to seismic effects prior to earthquakes as a result of increases in tectonic stress within the lithosphere. You have timed your article with a period of heightened unrest in 2011 / 2012 but in reality this is merely a spike falling within the bounds of natural variation.